Dr. Zand is Professor of Medicine and Medical Humanities in the Division of Nephrology. He is also Co-Director of the Clinical and Translational Science Institute, Co-Director of The Center for Leading Innovation and Collaboration and Director of the Rochester Center for Health Informatics. His clinical practice is focused on the care of kidney transplant patients. His approach emphasizes holistic care of the whole person, mind and body. He brings to his practice of medicine an extensive experience in cutting edge clinical immunology, and a practical approach to wellness emphasizing exercise, diet, stress-reduction, and mindfulness. He has an active research program in the biology of antibody producing cells and their role in vaccine responses, transplant rejection, and health informatics. Dr. Zand is a Professor of Medicine in the Division of Nephrology at the University of Rochester. In January 2015, Dr. Zand became Co-Director of the Clinical and Translational Science Institute (CTSI) funded by the NIH: NCATS, National Center for Advancing Translational Sciences. The CTSI develops, demonstrates and disseminates methods and approaches to advance translational research, by providing education and training, supporting transdisciplinary teams, improving quality and efficiency, and engaging community stakeholders. In July 2017, Dr. Zand became the Co-Director of the Center for Leading Innovation and Collaboration (CLIC) funded by the NIH: NCATS, National Center for Advancing Translational Sciences. CLIC offers data coordination services to collect, analyze and transform CTSA Consortium data to actionable insights that accelerate the impact of Consortium programs. It will also support effective, efficient and coordinated collaboration and team science. In the Fall of 2014, Dr. Zand founded the Rochester Center for Health Informatics, whose focus is using health informatics, graph theory, and "big data" analytics to understand how the healthcare system and the community are interconnected and interdependent, and how these connections contribute to population health. Dr. Zand graduated from Northwestern University with an undergraduate degree in Biomedical Engineering, a PhD in Cell, Molecular and Structural Biology, and an MD. He completed his residency in Internal Medicine and Fellowship in Nephrology at Beth Israel Medical Center and Harvard University in Boston. 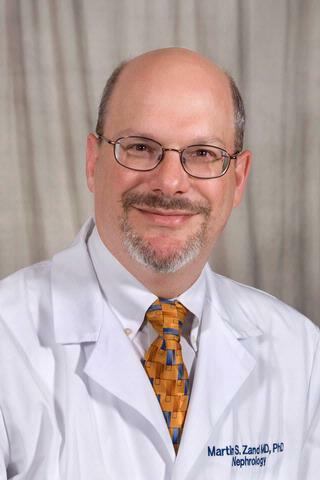 He joined University of Rochester Medical Center faculty in July 1998 as Medical Director of the Kidney and Pancreas Transplant Programs, which he led until 2014, when he became Director of the Rochester Center for Health Informatics. Dr. Zand has a clinical practice in Transplant Nephrology and Transplant Medicine, and sees patients with kidney and other solid organ transplants. He is an internationally recognized expert in B cell immunobiology in solid organ transplantation. He directs an active NIH funded research program in B cell immunobiology, vaccine biology, and computational modeling of immune responses. He leads the Rochester Center for Health Informatics, which is focused on using advanced data science methods to analyze population health data to create a "living healthcare laboratory" which improves community health and healthcare delivery. My research is focused in two areas: Understanding how B cells respond to vaccines and organ transplants to produce antibodies, and using graph theory to understand how we can understand and improve population health and healthcare delivery. My groups use a similar core set of analytic methods in both areas, including high dimensional clustering methods, graph theory, differential equation and stochastic branching process modeling. 1. What is the timing of B cell differentiation and antibody secretion, and how can we alter the molecular and cellular events to improve vaccine responses? 2. What are the molecular gene expression signatures of a successful B cell vaccine response? 3. How can we use mathematical models to create individualized treatment protocols for kidney transplant patients with antibody mediated rejection or allosensitization? My Health Informatics Group uses advanced data science analytics to understand how people make their way through the healthcare system, and how larger factors such as employment, mental health, community engagement, and socio-economic status contribute to population health. We use network theory to investigate connections between these factors, and turn those insights into population health based research initiatives that we refer to as the "living healthcare laboratory". We collaborate with groups in the Institute for Data Science, the University of Rochester Medical Center, and numerous community and population health groups within the greater Rochester community. Shen S, Li J, Hilchey S, Shen X, Tu C, Qiu X, Ng A, Ghaemmaghami S, Wu H, ZAnd M, Qu J. "Ion-Current-Based Temporal Proteomic Profiling of Influenza-A-Virus-Infected Mouse Lungs Revealed Underlying Mechanisms of Altered Integrity of the Lung Microvascular Barrier." Journal of proteome research.. 2016 Feb 5; 15(2):540-53. Epub 2016 Jan 08. Yang H, Baker SF, González ME, Topham DJ, Martínez-Sobrido L, Zand M, Holden-Wiltse J, Wu H. "An improved method for estimating antibody titers in microneutralization assay using green fluorescent protein." Journal of biopharmaceutical statistics.. 2016 26(3):409-20. Epub 2015 May 26. Wu H, Miao H, Xue H, Topham DJ, Zand M. "Quantifying Immune Response to Influenza Virus Infection via Multivariate Nonlinear ODE Models with Partially Observed State Variables and Time-Varying Parameters." Statistics in biosciences.. 2015 May 1; 7(1):147-166.